Ponytail Posse, an all-girls robotics team from Shoreview, MN recently visited our Minneapolis location to tell us a bit about what their group does and demonstrate some of their robot’s capabilities. This talented team participates in the “FIRST” program where they design, build, and program a robot to compete against other teams at regional tournaments. 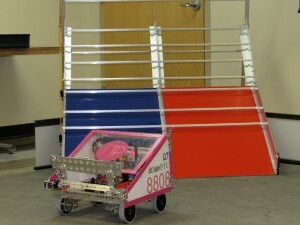 FIRST stands for “For Inspiration and Recognition of Science and Technology” and promotes STEM skills in schools. 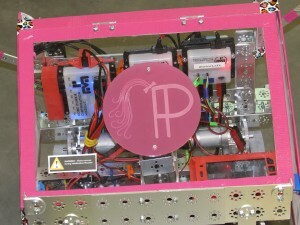 The Ponytail Posse has been together since elementary school, starting with FIRST’s Lego League programs, and is currently participating in their second year of the First Tech Challenge (FTC), which asks teams to build and program a robot based on a new challenge that is designed to challenge students to think critically and expand their knowledge of the engineering process. 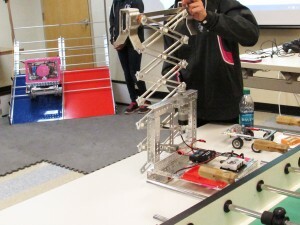 This year’s challenge: getting their robot to climb up a ramp and hang from the top bar. In our efforts to support local STEM programs, The Braun Intertec Foundation is a proud sponsor of the Ponytail Posse. Programs like this one shed a positive light on STEM skills and also promote engineering careers to school-aged youth. For more information on the Ponytail Posse, check out the team’s website here.